A September 16, 2016 Wall Street Journal editorial explained the West should give greater concern to Russian Federation President Vladimir Putin’s intentions in Moldova. It points to a referendum in the breakaway Moldovan region of Transnistria calling for annexation by Russia. That referendum along with recent political unrest and mass protests (as seen above) make Moldova appear ripe for conquest. Russia is trying to create greater ties in Moldova, but its efforts should not be misconstrued as a prelude to hybrid warfare. Western analysts must overcome the predilection of viewing any Russian moves westward as a step toward war. While the editorial notes Putin has been reticent about the decree, it also explains Putin has been flexing his military muscles in Transnistria. Drills were conducted by the Russian Federation’s peacekeeping force in Transnistria both in 2015 and 2016. Although Moscow promised in 2002 to remove its contingent of about 1,000 peacekeepers they remained in the territory. The Wall Street Journal surmises that those exercises and Shevchuk’s annexation decree may indicate Putin is testing the climate in the West for a potential next move. 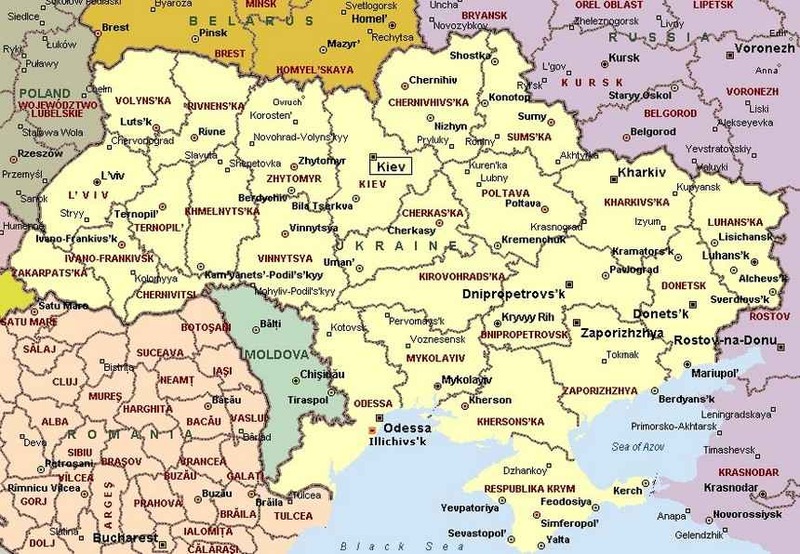 In response the Wall Street Journal says US and European leaders must telegraph that any effort to make permanent Russia’s occupation of Transnistria will be treated as an illegal encroachment on Moldovan sovereignty and trigger sanctions. Evidence may exist within certain parameters to support the view of the Wall Street Journal that Moldova might be ripe for Putin’s taking. 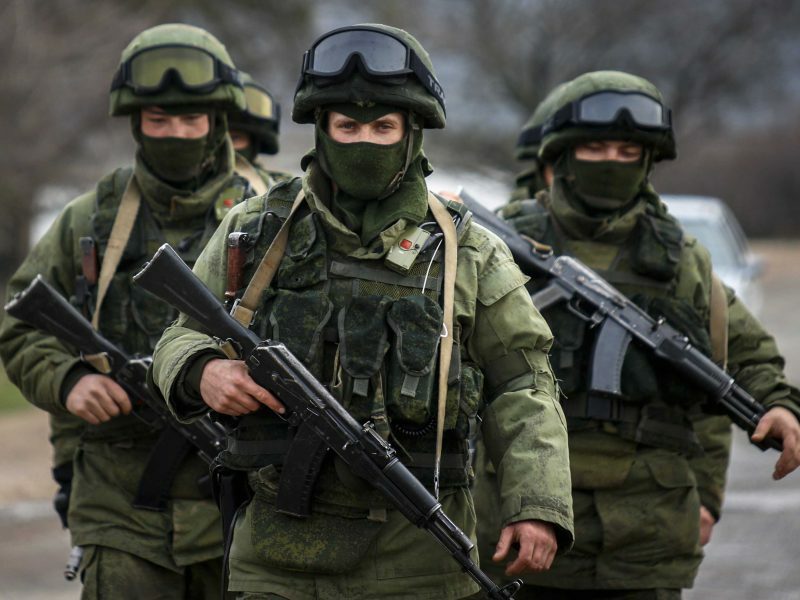 Western analysts, who think in line with the Wall Street Journal, have expressed concern that a prospective effort by Russia to take Moldova would come in the form of hybrid warfare—the blend of unidentified troops, propaganda and economic pressure. In addition to maintaining forces on Moldovan territory, for almost a year, pro-Russian political parties who receive support from Moscow, albeit along with considerable support from pro-EU, pro-Romanian parties, helped to organize mass anti-government protests which in 2015 and 2016 have involved tens of thousands of participants. The protests started after the three Molovan banks that had kept social security funds somehow lost $1 billion prior in November 2014. Pro-Russian political parties have also played a part in organization anti-government demonstrations, particularly in 2016. Throw on top everything the fact that Moldova as one of the poorest European countries has to deal with the pressing issues of overwhelming poverty, corruption, an inefficient legal system and widespread workforce migration to Russia and the EU. It may very well be true that Putin senses the West now lacks the determination to forcefully ensure its interests. Perhaps the West is doing less than it should to dissuade Russia from acting wherever it sees fit. Former Soviet republics and new Member States of NATO in Central and Eastern Europe fear the military might of Russia. Moldova was carved from Romania’s Bessarabia Province in 1940 by the Soviet Union as a consequence of its non-aggression pact with Nazi Germany. After declaring its independence from the Soviet Union, power shifted between the Communist Party which has sought a strong linkage with Russia, and pro-Romanian, pro-European parties which have advocated for EU membership. Since 2009, efforts have been made to move westward, but a final choice on which way to turn has not been made. In 1940, Moldova was carved from Romania’s Bessarabia Province by the Soviet Union as a consequence of its non-aggression agreement with Nazi Germany, the Molotov-Ribbentrop Pact of August 23, 1939. Since then, Moldova has been home to three main ethnic groups, Moldovans, Russians, and Ukrainians. When Moldova became an independent country, power shifted between the Communist Party which has as a custom sought a strong linkage with Russia, and pro-European parties that have advocated for EU membership. In 2009, pro-European parties took firm control in Chisinau, and in 2014, Moldova signed of an Association Agreement and a Deep and Comprehensive Free Trade to deepen political ties with Brussels and gradually integrate Moldova into the European Common Market. Exports increased, the economy grew, and, in response to reforms, including improving human rights, Moldovan citizens were entitled to travel visa-free into the EU. However, corrupt politics and a confusing, mazelike, parliamentary structure made it nearly impossible for Chisinau to recurvate in order to meet the requirements of EU ascension. After those initial days of change, little was done after to open up the country’s economy and its institutions. Moldova remains one of Europe’s poorest countries. Low incomes cause hundreds of thousands of Moldovans to seek a better life abroad. Many Moldovans still look to the EU for answers. It accounts for the fact that the majority Moldovan voters in the past three parliamentary elections since 2009 have opted for liberal, pro-Western, and albeit, pro-Romanian governments. In that vein, many officials in Chisinau see Romania as a vital counterweight to Russian influence. Bucharest is generally recognized on the international stage as a representative of Moldova’s interests in the network of international organizations, as well as a source of financial air and the know-how necessary for the implementation of reforms. However, other Moldovans instead believe prosperity lies with Russia and the Eurasian Economic Union. The gap between social and political forces in the country progressively widened. Both sides seem to have temporarily united in response to the average Moldovans’ resentment toward the elite, the oil oligarchs. The disappearance of $1 billion from the country’s banks stoked that frustration. It well-illustrated the failure of Moldova’s leaders to protect their citizens’ interests. The news spread and caused the depreciation of the local currency, the leu. Price increases and soaring interest rates were accompanied by the loss of purchasing power of the local population Official sources report that in 2015, the average salary in Moldova was just $250. Public finances were battered by the bail-out required to stabilize the banks. Occasio aegre offertur, facile amittitur. (Opportunity is offered with difficulty, lost with ease. 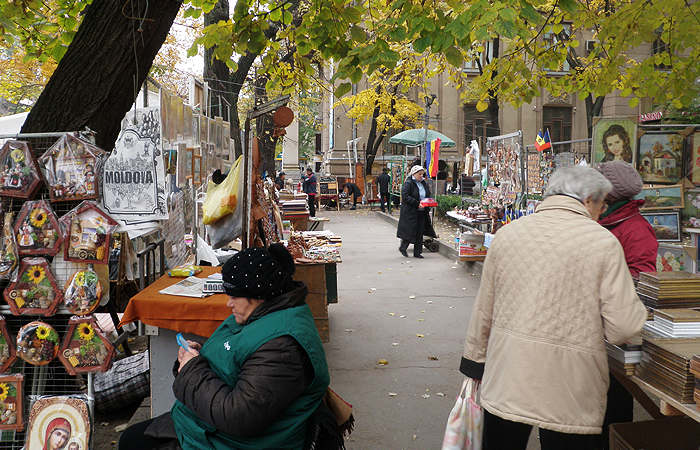 Moldovan street vendors (above). In 2009, pro-European parties took firm control. in Chisinau, and in 2014, Moldova signed of an EU Association Agreement and a Deep and Comprehensive Free Trade to deepen ties with Brussels and integrate Moldova into the European Common Market. Exports increased, the economy grew, and, in response to reforms, including improving human rights, Moldovan citizens were able to travel visa-free into the EU. Yet, after those initial days of change, little more was done to open up the country’s economy and institutions. Moldova remains one of Europe’s poorest countries. In the spring of 2015 citizens already fed up with the disappearance of $1 billion from Moldovan banks, corruption, poverty, and immigration problems for twenty-five years since the breakaway from the Soviet Union, engaged in large-scale protests country-wide. The protests were organized in the Dignity and Truth Platform Party that was established in February 2015, particularly in response to the theft of funds from the banks. Dignity and Truth, has been led by lawyers, journalists, and members of Moldovan civil society. It sharply has criticized the authorities and simultaneously has supported the formation of an authentic pro-EU reformist government and pushing for the country’s EU integration. One protest was attended by over 100,000 citizens. Most recently, in August 2016, tensions boiled over during Moldova’s Independence Day parade. Protesters clashed with police in the capital. One protester lamented: “We decided to celebrate this day in the manner because we do not at all feel free. People are poor, people leave the country. 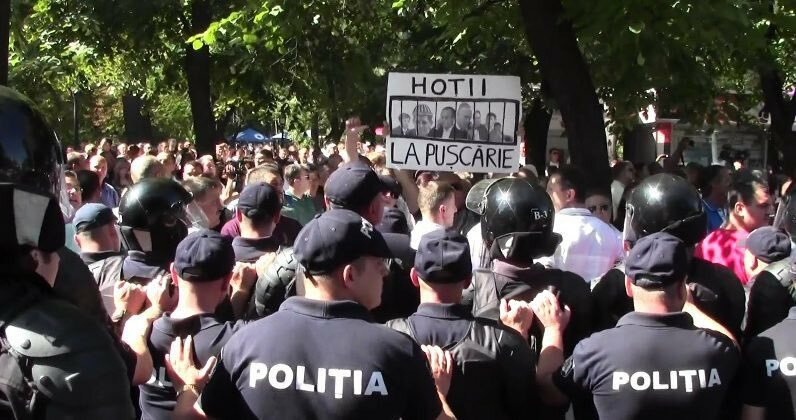 Those who have recently stolen a billion dollars from us, organize military parades, waste millions from the budget on it, which essentially means from our money in time crisis.” Protesters also expressed anger against oil oligarch Vlad Plahotniuc’s influence in the government and called for early elections. 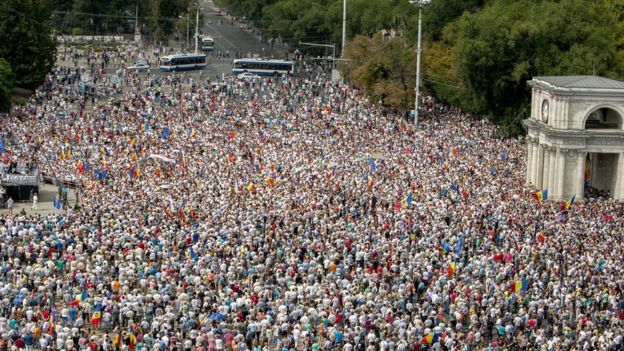 Mass protest in Chisinau, September 2015 (above). In Moldova, citizens already frustrated by corruption, poverty, and immigration problems for twenty-five years since the breakaway from the Soviet Union, engaged in large-scale protests country-wide since the spring of 2015. The protests were organized in the Dignity and Truth Platform Party that was established in February 2015, particularly in response to the theft of $1 billion in funds from the banks. Protests had included as many as 100,000 citizens. Tensions boiled over recently over Moldova’s 2016 Independence Day parade. In 1990, fears that Moldova might seek to unify with Romania led the region to declare its independence, calling itself the Gagauz Republic, even before the Transnistria conflict erupted. Moreover, unlike Transnistria, fighting never broke out in Gagauz. A 1994 compromise between Chisinau and authorities in the Gagauzia’s capital, Comrat, led to the creation of the autonomous region of Gagauzia within Moldova. Initially, Moldova’s law on the status of Gagauzia gave the region the right to declare independence should Moldova “lose its sovereignty,” at the same time, meaning seek unification with Romania, but a 2003 amendment to the Moldova constitution abolished that right. declaring Gagauzia a “constituent and integral” part of Moldova. The Gagauz are Orthodox Christian people of Turkic origin who settled in the region nearly 800 years ago and are linguistically, ethically, and culturally distinct from their Moldovan, Romanian, and Ukrainian neighbors. Gagauzia, along with the remaining territory known as Bessarabia, became part of the Russian Empire following the Russo-Turkish War from 1806-1812. While other parts of the eventual Soviet Union saw a decent amount of ethnic integration, over 80 percent of the territory’s population remains Gagauz. Still, it’s population of 160,000 represents about 5 percent of Moldova’s total population. Gagauzia is not actually a congruous region. It includes all areas of Moldova in which the Gaguaz are over half the population, as well as parts of the country that have joined Gagauzia by referendum. 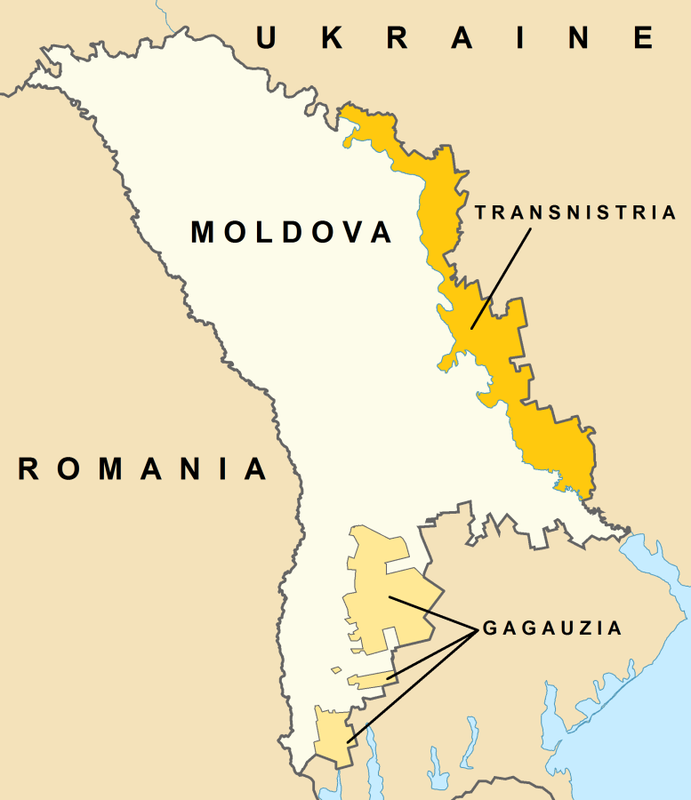 Gagauzia’s boundaries have gone through several revisions since 1994. occupying just 5 percent of Moldova’s territory. Transnistria is an unrecognized republic which was declared in 1990. With Rusia’s assistance, it managed to prevent Moldova from reclaiming its territory in the War of Transnistria in 1992. Since the war ended, the Russian Federation has stationed 1000 peacekeepers there. Fighting never broke out in Gagauzia and Russia has no troops there. A 1994 compromise between Chisinau and local authorities in Comrat led to the creation of the autonomous of Gagauzia within Moldova. With a population of 160,000, it is a non-contiguous territory occupying 5 percent of Moldova’s territory. Since great portions of Moldova’s population are ethnically associated with its neighboring countries, neighboring governments have established lines into Moldova. 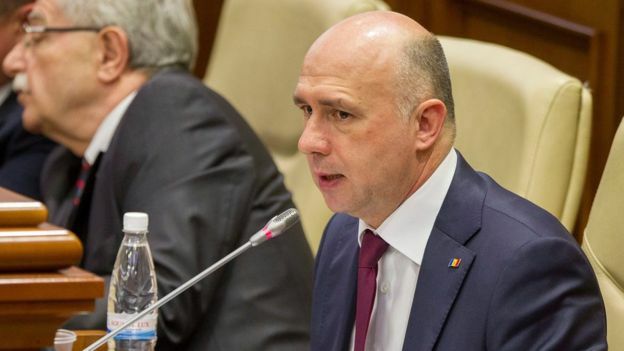 Besides its traditional goals of consolidating its own position within the EU and NATO and bolstering its partnership with the US, Romania for years has declared that Moldova is a priority of its foreign policy. Romania’s policy aims toward Moldova include reinforcing its neighbor’s position within the system of Western institutions and improving its international linkages. In that vein, Romania has also tried to prevent any attempt to deepen Moldova’s integration in Russian structures, primarily the Eurasian Economic Union. That requires Bucharest to achieve its aims at the political and diplomatic levels, but also by increasing economic ties with Moldova. Often the notion of Moldovan-Romanian unification is discussed by Romanian political leaders, However, for now, that is unrealistic for political, economic, and social reasons. In Bucharest, politicians would lose power and most would be deprived of career prospects, and established political and business interests would be jeopardized. Romanian policy towards Moldova, and by extension the two countries political relations, are most often shaped, among other factors, political pragmatism resulting from the desire to win the support of the Romanian electorate. Romania has managed to play a generally positive role in drawing Moldova toward Western structures and has been effective in its actions, its effectiveness in other areas of bilateral cooperation has been negligible. The technical support that Bucharest has provided is less than necessary, and infrastructure projects have been seriously delayed as a result of problems in coordinating actions among relevant ministries. This has led to a large breach between Bucharest’s frequent declarations of support for Moldova and actual results. Indeed, Romania has not implemented a coherent strategy toward Moldova. Its policy has essentially been a function of domestic, not foreign policy. Bucharest’s political objectives are often subordinated to rivalry among Romanian political parties. Moldova (shaded green above) and its neighbors. Romania for years has declared that Moldova is a foreign policy priority. Its policy aims for Moldova include reinforcing its position within Western institutions and improving its international links. Ukraine and Moldova have unresolved bilateral issues include long lasting property issues related to resorts inherited from the Soviet Union, a hydroelectric station, and an issue of border demarcation. Russia views Moldova as an integral part of its geopolitical and cultural space and invests a great deal in preserving and increasing its influence in the country. Regarding Transnistria, since 2014, Ukraine has massed heavy weapons on the border with the statelet to deter the launch of a military campaign from it. 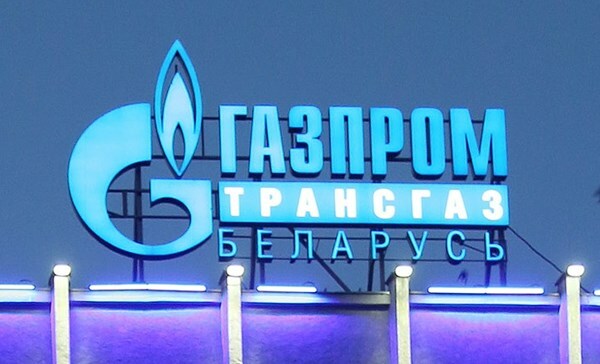 Kiev gas also imposed limits on the transit of Transnistrian nationals and citizens of Russia, 200,000 of whom currently live in Transnistria. There are 500,000 ethnic Russians in Transnistria. When appointed in June 2015, the Governor of Ukraine’s Odessa Region Mikhail Saakashvili announced plans to reinforce Ukraine’s border with Transnistria. He stated at an Odessa news conference, “We have two major tasks—to reinforce the border and curb corruption. 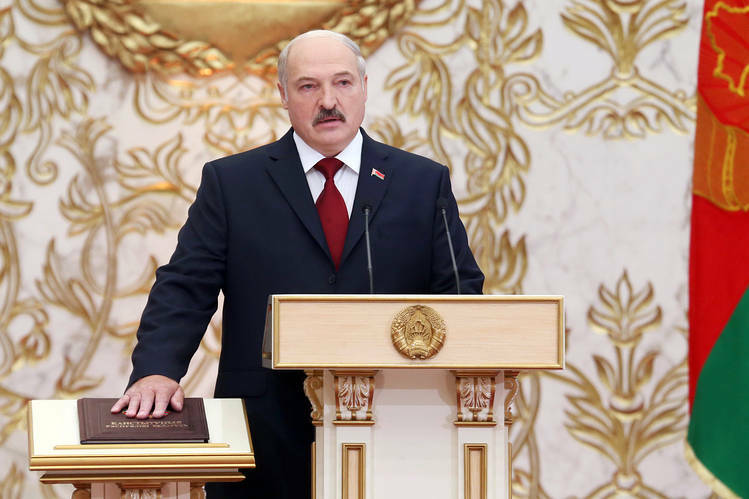 Drugs and weapons trafficking across the border means nothing good.” He also blamed Transnistrian authorities of destabilizing the situation in Ukraine. The Wall Street Journal’s assay of the Russian Federaton’s Moldova policy was correct to the extent that it explained Moscow wants Moldova to remain in its sphere of influence. 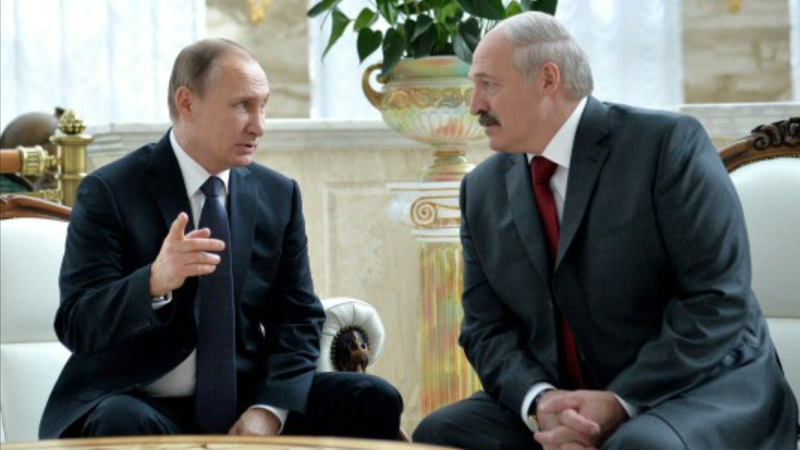 Putin wants Moldova to join his Eurasian Economic Union and not the EU. He considers Moldova to be an integral part of Russia’s geopolitical and cultural space and has invested heavily in preserving and increasing its influence in the country. It uses elements of soft power to gain control of assets and political opinion support. Russian authorities can also manipulate Moldova through its dependence on Russian policies on gas supplies. Within the Russian speaking population of Moldova, sentiment has ostensibly been manipulated through the idea of Russkiy Mir (Russian World). True, the Moldovan heritage is not Slav. Still, Sovietization and Russification had an impact on the identity of many Moldovans. 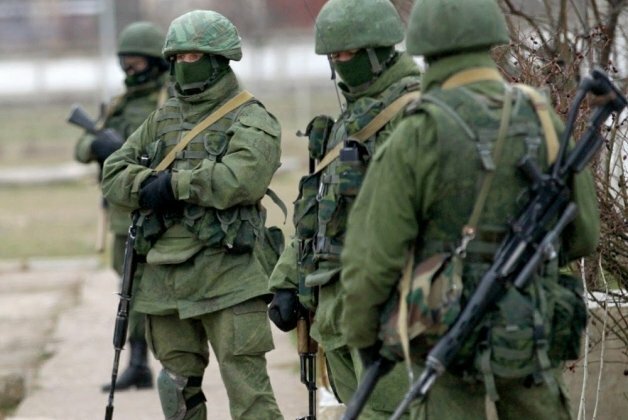 “Green men” in Crimea (above). Russia’s annexation of Crimea and the explosion of violence in the Donetsk and Luhansk, exposed the challenge Chisinau faces in maintaining its border and interpreting Russia’s actions and intentions. The Wall Street Journal editorial noted Putin has been flexing his military muscles and testing the climate in the West for a potential next move. Considering this, it would not be completely unreasonable for Chisinau to consider that Moldova might be facing the threat from hybrid warfare. The country’s institutions—particularly military and law enforcement—are infiltrated. Governmental power is corroded by fomenting riots, staging violent demonstrations, and generally igniting civil unrest. Legitimate power is replaced by the capture of government buildings by force and local law enforcement and military units are disabled. Moscow has already punished Moldova for seeking closer ties with the West. Import bans were placed on Moldovan wines in 2013 and agricultural products in 2014, each time over health regulations and each time close to Moldovan EU summits and accords. New restrictions on remittances that Moldovan workers in Russia send home have also hampered economic growth. Remittances represent over 30 percent of Moldova’s GDP and up to 65 percent of them come from Russia. Once the Association Agreement and a Deep and Comprehensive Free Trade Agreement were signed with the EU in June 2014, prices of imported gas from Russia rose. Moldova is heavily dependent on imported energy and the Russian state-owned Gazprom is its main supplier of gas. To reduce Moldova’s dependency on Russian gas, a pipeline was constructed between the Romanian town of Iasi and Moldova town of Ungheni. Although the pipeline was ready for use, Chisinau, seemingly concerned over displeasing Moscow, announced in November 2015 that it had extended its gas contracts with Russia for another year. There are fears that tensions between the pro-Russia population and the pro-Romania Unionist which support reunification with could also make Moldova vulnerable and could provide Russia a plausible justification to intervene. Russian media which is widely available in Moldova, serves as a soft power instrument for wider dissemination of Russian official propaganda and anti-Western messages. 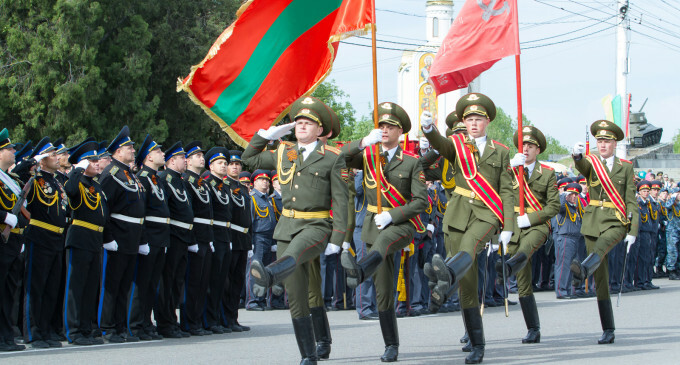 Transnistrian troops on parade (above). Transnistria’s leaders in Tiraspol say Moldova and Ukraine have conspired to keep their country under an economic blockade. Russia accuses Moldova and Ukraine of squeezing Transnistria. Kiev denies any systematic actions against Moldova except suspending military cooperation after Moscow annexed Crimea and began supporting rebels in Eastern Ukraine. Still, Kiev has built up its forces on its border with Transnistria. 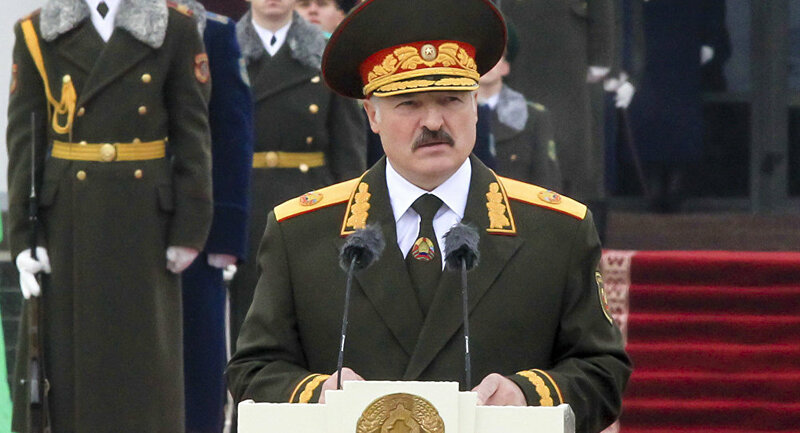 Transnistria has mobilized its army reservists between 18 and 27. Its forces have participated in exercises with Russian Federation forces since 2015. In his speech at the Munich Security Conference on February 13, 2016, Russian Federation Prime Minister Dimitry Medvedev referred to the political crisis in Moldova as a major threat to European security. Many nfluential Western politicians are of the same opinion. On August 10, 2015, Thorbjorn Jagland, the Secretary-General of the Council of Europe, referred to Moldova as “an occupied state” and pointed out that the country could become the next issue for EU security. He stated: “Many in Moldova worry that Transnistria could become the next Crimea, an anxiety that has been further fueled by appeals for Russian protection from some of the province’s civic groups.” Despite protests from Chisinau, in April 9, 2015, Russian forces conducted a drill in Transnistria. According to Russian news agencies, 400 Russian troops participated in exercises in Transnistria. They fired 100,000 rounds of ammunition. Again, on August 2016, Russian Federation forces stationed in Transnistria held a tank drill in the territory. Some Western analysts went as far as to say such exercises were intended to create the impression that Putin might take more dramatic action to subdue that defiant country. Western analysts also allege Putin was sending a warning to Moldovans to abandon their dreams of Western integration. Russia accuses Moldova and Ukraine of squeezing Transnistria. Kiev denies any systematic actions against Tiraspol other than the suspension of military cooperation that followed Moscow’s annexation of Crimea and actions in eastern Ukraine. On June 12, 2015, Ukraine moved troops toward its border with Transnistria. Alarmed, Transnistria’s Deputy Foreign Minister Vitaly Ignatiev stated, “the situation here is very bad . . . Economic production is going down, foreign trade is shrinking, the security situation is equally alarming with our Moldovan partners holding military drills with NATO and the Ukrainian pressure mounting everyday.” Transnistria’s leaders believe Moldova and Ukraine have conspired to keep their country under an economic blockade and have mobilized their republic’s army reservists between 18 and 27. If Moldova faced Russian military intervention, it would unlikely be able to successfully respond. In terms of preparations by Chisinau, Moldovan forces initially began conducting a series of exercises ostensibly to prepare for a possible Russian attempt to seize its territory following Russian actions in Crimea and Donetsk and Luhansk. Those exercises, however, convinced few in Moldova that the country was at all prepared to efficaciously defend itself against hybrid warfare or any other type of attack. Those efforts made seemed more than anything else to be examples of “pokazuhka.” In the Soviet Union, pokazuhka referred to performances by units designed by military commanders to create the appearance of troop combat readiness to impress superiors and gain commendations. Beyond such window-dressing style training, Moldovan forces lacked military hardware, spare parts, fuel, munitions, body armor, food supplies, and light anti-tank weapons. The defense budget has been kept at $30 million, hovering between 0.3 and 0.6 GDP for the last several years. What Moldovan forces need to know is how to fight in densely populated urban and rural areas, train in the calibrated use of artillery avoid the self-destructive act of demolishing their own country’s infrastructure, and train to fight in an environment in which their opponent would restablish air superiority. To prepare for possible Russian aggression, Moldovan forces initially began conducting a series of unilateral exercises. Those exercises, however, convinced few that Moldova was at all prepared to efficaciously defend itself against hybrid warfare or any other type of attack. 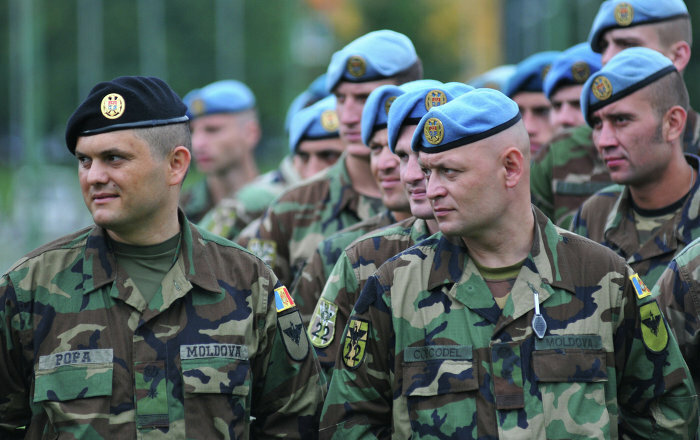 Moldova soon received opportunities to train with NATO troops. Still, training and assistance to Moldova will be limited because it is not a full NATO member. To help Moldova, a member of NATO’s Partnership for Peace program, on July 25, 2015, about 800 troops from Moldova, the US, Romania, Poland, and Georgia took part in a joint military exercise in at the Balti military base in Moldova. The aim of exercise known as Joint Effort 2015 was to test the capabilities of the countries’ armed forces to cooperate. 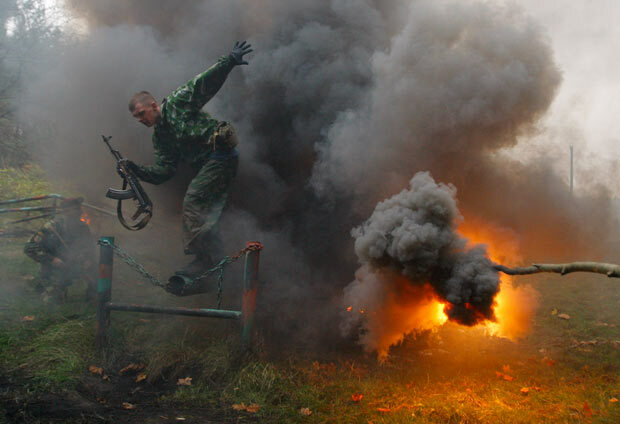 Moldova has since hosted additional military exercises since. Indeed, as part of the on-going cooperation between US and Moldovan defense forces, US, Moldovan, and Romanian troops conducted exercise Fire Shield 2016, a combined small arns, artillery training exercise at the Bulboaca Training Area, Moldova. The purpose of the exercise is to improve interoperability, explore concurrent training opportunities, and conduct safety training. Yet, training as well as assistance to Moldova will be limited because it is not a full-fledged NATO Member State. Moldova might receive some critical non-lethal equipment such as counter-battery radar, secure communications, and tactical drones. 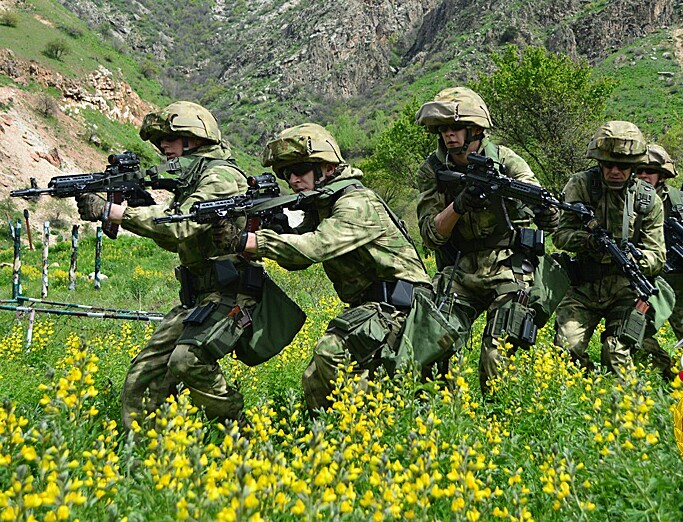 NATO could also intensify the training of Moldovan military forces in territorial defense However, none of that will truly make Moldova capable of deterring possible Russian aggression. Pro-Europe national leaders in Chisinau pray to be part of the EU and NATO, but that possibly will not come right away. Granting Moldova NATO membership now, albeit hardly a possibility, or in the near future, may pose a set of problems that other member states may not ever want to deal with. Some in the West may even oppose arming Moldova, calculating that doing so would only cause Russia to inject more military forces in Transnistria. All of this means Chisinau should not feel certain of the US and EU commitment to help protect Moldova’s sovereignty and rights as an independent country. The administration of US President Barack Obama has indicated that the present and future challenge of US foreign policy is no longer to isolate and defeat an existential foe as Russia. Rather, it is creating a sustainable balance of power that advances the US interests by preserving peace and security and fostering collaboration among geopolitical rivals in addressing global transnational threats. It is difficult to assess how a new US administration will respond over Moldova. A false positive is an error in an evaluation process which leads one to conclude that a given condition has been fulfilled when it actually has not been fulfilled. Russia certainly has exerted pressure on Moldova, but that may only be part of an effort to strengthen its diplomatic hand, not an overture to war. 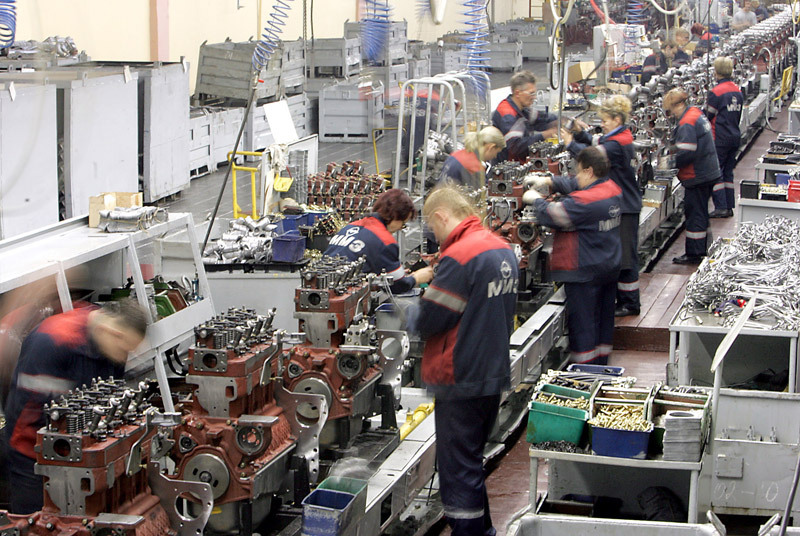 Russia is well-aware that cooperation stimulates economic growth and higher standards of living on both sides of a border by improving conditions for free trade and exchange. Russia believes that can be achieved by investment and integrating the region into the communication and transportation networks of its Eurasian Economic Union. Inter-border cooperation is understood to be a prerequisite of broader integration processes and improving relations between neighboring countries. It can serve as a mechanism for coping with the challenges and jolts resulting from the new divisions created between EU and Eurasian Economic Union countries. Domestic policy priorities and international and regional security issues can be harmonized through it. Inter-border cooperation can also serve to promote minority rights. In July 16, 2016, Moldovan Prime Minister Pavel Filip held important meetings with Russian Federation Deputy Prime Minister Dimitry Rogozin in Moldova. The aim of the meeting was to tackle the bilateral cooperation agenda. Rogozin offered a proposal for invigorated contacts between Chisinau and Tiraspol that would allow for normal relations, “above all in economics.” They discussed the division of Moldova into zones of influence,” one looking toward the EU, the other looking toward the Eurasian Economic Union. Russian Federation Deputy Prime Minister Dimitry Rogozin made a two-day visit to Moldova on July 6, 2016, during which he had important meetings in Chisinau with Moldovan Prime Minister Pavel Filip. The aim of the meeting was to allow the two officials to tackle the latest developments concerning the main elements on the bilateral cooperation agenda. 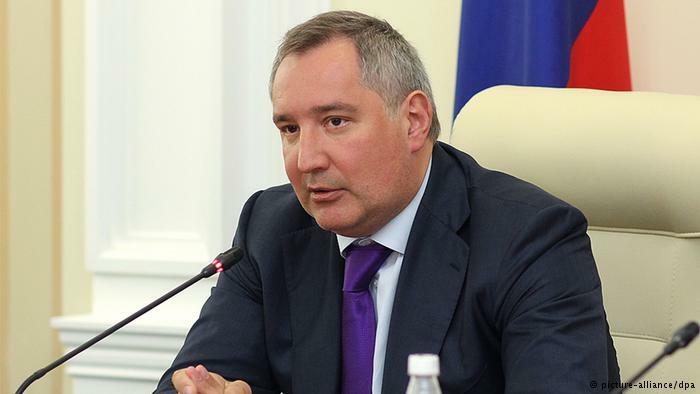 Reports indicate Rogozin came at the invitation of Filip. Filip emphasized Moldova’s interest in boosting the trade and investment relations with Russian partners and in particular, in the integration of Moldovan goods export to the Russian market. The Transnistria conflict settlement was also an important issue on the meeting agenda. Rogozin and Filip expressed support for the 5+2 talks, and welcomed the resumption of the discussion in this format. Additionally, the two officials discussed aspects of their countries’ cooperation in the migration sector, as well as in the cultural and humanitarian fields. They recognized the need to promote more governmental programs on developing ties in these cooperative areas. Omne tulit punctum qui miscuit utile dulci. ([He] has gained every point who has combined [the useful with the] agreeable.) More detailed reports of the meeting between Rogozin and Filip, however, paint a more intriguing picture Rogozin explained Russia wanted to see invigorated contacts between Chisinau and Tiraspol aimed at a return to normal relations, “above all in economics.” What the two officials most importantly discussed was the de facto division of “zones of influence” one looking toward the West and the EU and one looking toward the East and the Eurasian Economic Union. The formally unrecognized Transnistria and the autonomous Gagauzia would be part of the eastern zone. The arrangement would also allow for the free movement of people and goods between them and to the broader communities of which each is a part. Further, the division of zones of influence would ostensibly spread to all areas of life, including information policy and civic freedoms. Activities that would be perfectly legal in one zone in Moldova could possibly result in arrest in the other. 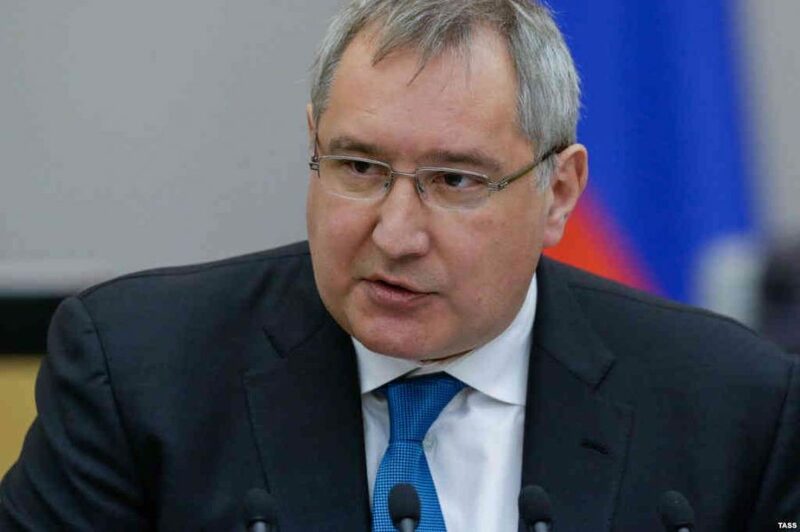 With regard to trade with Moldova, Russian Federation Deputy Prime Minister Dimitry Rogozin has presented a proposal to Moldova that would result in a creative arrangement for Russia. As Moldova is not subject to EU sanctions, theoretically, Russia could move its goods into a proposed European zone in Moldova via Transnistria and Gagauzia and thus escape restrictions. Simultaneously, the territories would become points for the expansion of the Russian world. Given the need to ensure that those territories remain part of Moldova, Moscow would hardly consider annexing Transnistria or Gagauzia. In Act II, Scene ii of William Shakespeare’s comedy, Trolius and Cressida, Hector, the Prince of Troy, a fierce warrior, and leader of the Trojan armies, states: “Modest doubt is call’d The beacon of the wise, the tent that searches To the bottom of the worst.” Searching for the worst, one might consider that if things do not go Russia’s way in Moldova’s coming presidential elections, Moscow could begin to quietly provide enhanced economic support to Transnistria and Gagauzia. That aid might take the form of a considerable amount of Russian rubles to encourage greater purchases of Russian goods. That aid might initially be cloaked. It could also continue to provide humanitarian aid using truck convoys. Russia could provide financial support to pro-Russian separatist political organizations. To encourage ethnic-Russians to remain in Transnistria and Gagauzia, Russia may assist directly in the infrastructure improvements in those territories, as well as focus on the construction of new schools, churches, community centers, and infrastructure projects that meet the needs of those communities. At the same time, Russia could enable pro-Russian separatists in Transnistria and Gagauzia as a hedge against any attempts to reverse gains made. Separatists could be enabled to defend themselves with training from Russian military advisers perhaps acting covertly and they could also be provided with new Russian armaments. Russia would unlikely withdraw its forces in Transnistria and could possibly increase the measure of those forces to create the capability to rush into restive Gagauzia if any fighting began there. It is easy to postulate such theories on possible moves by Moscow, they are unlikely to be observed in Moldova. A decision against Russia’s interests in Moldova will not create an ultimate crisis for Moscow. The wisdom exists to resist war. Nihil est incertus volgo. (Nothing is more uncertain than the favor of the crowd.) Moldova’s sovereignty is as important an issue in coming elections as the country’s economic future. Paramount in considering Rogozin’s proposal is that it would not only establish the defined interests of Moscow, but would also preserve Moldova’s unity, solvency. Despite imperfections in the proposal, it might best serve Moldova’s interests for the moment. 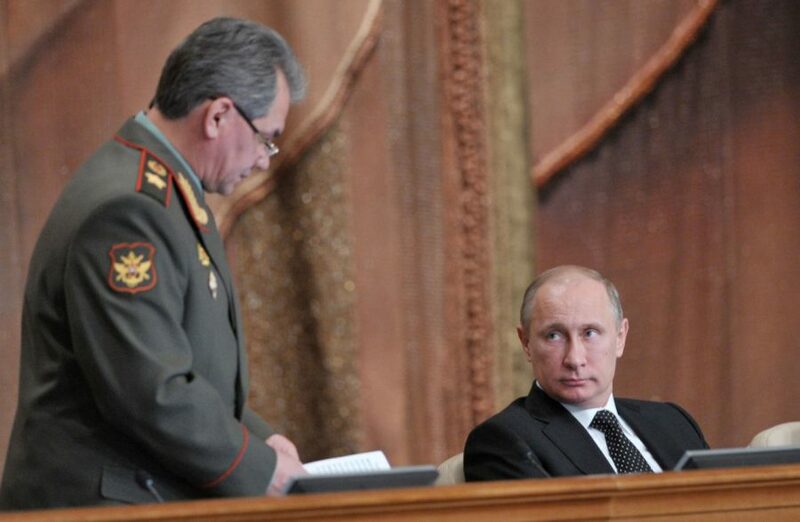 To an extent, Rogozin’s proposal represents an effort at compromise by Moscow. Unable to bring all of Moldova into its Eurasian Economic Union, it seeks to create spheres of interest. It may very well be a signal from Moscow that it intends to stick with diplomacy to resolve its issues with Moldova. Despite veiled threats from some senior Russian Federation officials and apprehension among Moldovan officials, Chisinau signed the Association Agreement with the EU in 2014. Moldovan officials now appear somewhat concerned over Russia’s reaction to a possible vote by Moldovans to remain on a western track in coming presidential elections. If they vote to go West, it ironically may prove to have been Moscow’s adherence to a diplomatic tack on establishing zones of influence that created enough breathing space for them to feel unafraid to do so.